There are few things in life more wonderful than when two of your favorite celebrities meet, and if you're a fan of the royal family like I am, I have a series of photos for you that will probably make your day. During a trip to Barbados on Wednesday night, Prince Harry met Rihanna, and it resulted in some of the cutest pictures I've ever seen. Despite how different these two might be, it looks like they totally hit it off. And now, all we need is for Rihanna to invite Harry into the studio to lay down a track or two. Could you imagine?! 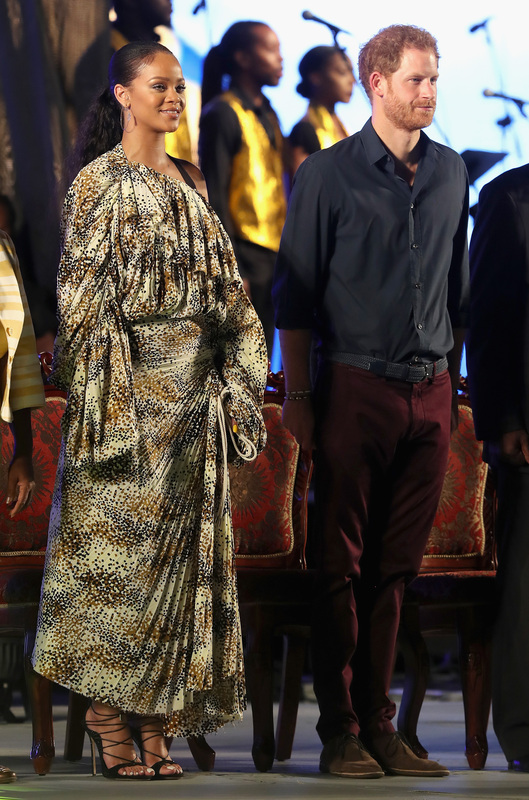 According to Daily Mail, Harry and Rihanna — two people so important that neither of them require last names — met earlier in the day at an event that marked 50 years of Barbados' independence, something Rihanna has a vested interest in since it is, after all, her home country. Harry went on stage and passed on a message of congratulations for the Queen, and apparently, proceeded to make Rihanna his best friend. Later that night, they both attended the Golden Anniversary Spectacular Mega Concert, where they sat side by side and looked like friends who had known each other for years rather than fabulous strangers who had never met until hours earlier. See? Best friends. And honestly, I can't figure out if I'm more jealous of Rihanna because she met Prince Harry, or Harry because he met Rihanna. Hmm. Regardless, I'm probably going to have these photos printed and framed to hang in my home. These two might live completely different lives, but it looks like they definitely enjoyed each other's company. I hope this is the beginning of what will eventually become a beautiful friendship. If Harry and Meghan Markle end up getting married, I want Rihanna to have an invite. You know she'd be the life of that reception, and she'd probably bring a killer gift.